In the tray full of beads, what is the probability that you will grab a black bead? In the tray full of beads, what is the probability that you will grab a bead that is not totally black?? 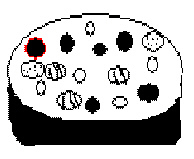 If we spin the pie and you close your eyes, what are the chances that you will pick a dotted slice? 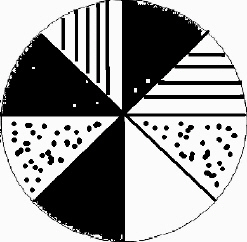 If we spin the pie and you close your eyes, what are the chances that you will pick either a black slice or a slice with lines on it? If we flip these coins, what are the chances that they will both end up heads?